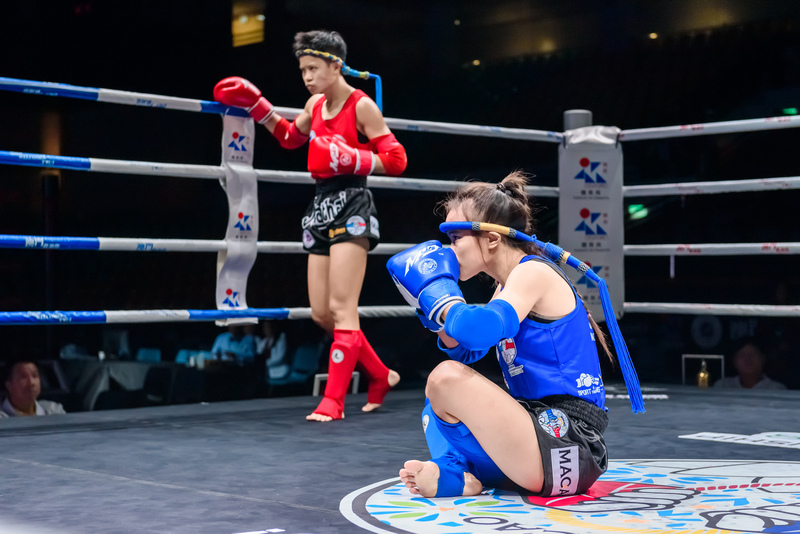 Host nation Macau left their mark on the muaythai rings today, saving the best until last when one of the women’s team advanced in an exciting bout, and one of her male team-mates also moved on to the next level. Supporters organised themselves into a tight group behind the ring, and they were certainly heard. Si Long Tam represented the home crowd at 48kg against Ruwani Dilhani Samaresekara Virdana Pathiranage from Sri Lanka. One of the final bouts of the day was worth waiting for as Si Long is a popular home champion. She worked well with her hands, using spinning back elbows and driving punch combinations to move forward . And scored high in the clinch but didn’t have it all her own way as Ruwani connected well with her right hand particularly, and had a solid lower-kick which earned her enough points to stay in the race until the third round. Team-mate Pan Leong moved on at 51kg, but unfortunately the third person competing today Man Seng U lost out to a stronger Afghan opponent Ahmad Shuja Jamal. A second Afghan athlete also progressed when Alisohrab Ahmadi defeated his Philippines opponent. in an equally fast-paced bout. One of the Iranian team Kavan Azadi also advanced to the next round. Five of the Thai team moved into the next rounds. Two of these wins came in 29-28 point victories meaning it all came down to the final point with all athletes concerned pushing to the bell – Naluedon Chaiyawuet defeated Yerkanat Ospan (KAZ) and Veerasak Senanue won against Bakytzhan Arifkhanov, also from Kazakhstan. IFMA Instagram IFMA Twitter and of course live action on the IFMA Youtube Channel.